Tyler Wilde: Justice! 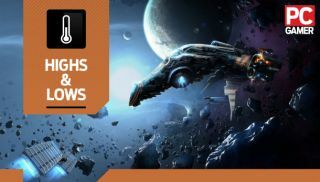 After a monument to the players of Eve Online was vandalized at Fanfest , damaging public property and targeting another player whose name was scratched out, the culprits have been identified and “permanently removed” from the game. Legal action may be on the table, too, judging from CCP's initial statements. Fanfest is a celebration. I went last year and loved it, and loved all the Eve players I met, and it's a shame such a friendly community is being cast in such a poor light. They take the game very seriously, but they also know it's a game, and that all the piracy and betrayal is just part of the fun—until a few take it too far. Scratching an art installation might seem like a minor crime, but CCP's firm response sends an important message: taking in-game rivalries into the real world is never OK. I'm glad the vandals aren't getting away with it. Evan Lahti: We fundamentally have no idea what it'll be like, because zero lines of code have been laid for it yet, but jumpin' giblets — Unreal Tournament is finally awaking from its seven-year slumber . Epic's plan to couldn't be more promising; I'm outlining the genius of its collaborative roadmap later today on the site. It'll be a return to our favorite gun in PC gaming and one of our favorite modes (Instagib), but might also bring another viable competitive shooter to the PC alongside CS:GO, which essentially stands alone in that category at the moment. Wes Fenlon: It's been a great week. Unreal Tournament is coming back as an honest-to-god free, not free-to-play, game, as Evan has already said right there above me. But the highlight of my week has definitely been our exclusive first look at Killing Floor 2. I spent about 12 hours at Tripwire's offices talking to them about the game and seeing it in action, and it was a blast to write about. I love that they're focused on a fairly underrepresented genre, the co-op wave-based shooter. And they're doing it the old-fashioned way—Killing Floor 2 is a simple game that harks back to the shoot first, ask questions never style of '90s FPS. Of course, the technology they've worked into the game for procedural gore and permablood is all new. We talked about so much stuff, I ended up writing a separate short feature on Tripwire's approach to weapon design and breaking out a separate interview with John Gibson. I just wish they'd told me when the damn game was coming out. I want to play it. Phil Savage: I've been without internet this week and, besides suffering the occasional itch of phantom websites, it's been a good excuse to dip into my Steam backlog. The biggest surprise has been DmC. I'm not going to say it's the best third-person brawler—I've played Bayonetta—but whenever I felt like I was done with its frantic hacking and/or slashing, a clever concept level kept me moving forward. The best of these is called The Plan, and involves Dante breaking in to the big-bad's evil lair. As he infiltrates the tower, chalk drawings are overlaid throughout the level as a stylistic flashback to the heroes' plan. It's inventive and interesting, and a great example of how to use aesthetic flourishes to keep the player guessing. Tim Clark: My debilitating, I'm-almost-certainly-going-to-end-up-living-under-a-bridge addiction to another game (see this week's Lows on the following page) has meant my Don't Starve save sits, frozen and no longer loved, around the 270 day mark. I haven't even managed to tear myself away long enough to try the excellent looking Reign Of Giants DLC beta. However, the announcement that the game will—contrary to all Klei's previous protestations—be getting a multiplayer component this summer, is both a surprise, and enough to tempt me back. I'm curious to discover how having friends on hand to help will alter the game's famously harsh vibe. Tom Senior: I like to ride the cutting edge of videogame technology, so this week I installed Vampire: The Masquerade - Bloodlines released in, er, 2004. It's really good. It's as though all of the people on the internet who've dubbed it a smart RPG with a satisfying branching narrative and neat social mechanics were right after all. I'm still busy navigating the many entwined subquests hidden around the detailed starting hub. I've broken the Masquerade (the vampire code of conduct) only once and retained most of my humanity, in spite of the bit where I drank the blood of a vagrant and then vomited it all back up on the floor and ran away. If, like me, you've wanted to try Vampire Colon The Masquerade Dash Bloodlines for ages, I'd recommend it, as long as you don't mind bursts of weak combat between the interesting vampire society stuff. Be sure to check out Wes' guide to getting it running smoothly with the essential unofficial patch.